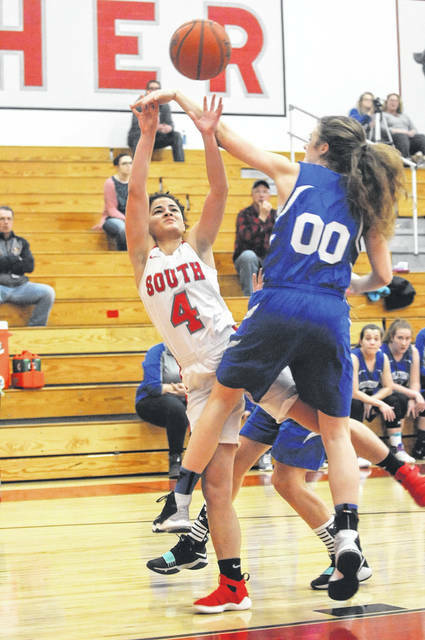 Twin Valley South’s Mylan Crews with led the way with 14 points in the Panthers 63-23 win over Middletown Christian on Thursday, Feb. 15. With the win, South doubled its win total from a year ago. 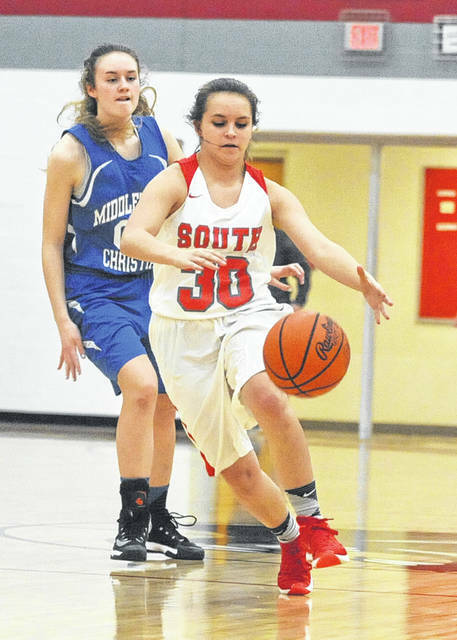 WEST ALEXANDRIA — With wins over Mississinawa Valley and Middletown Christian to close out the regular season last week Twin Valley South’s girls’ basketball team doubled its win total from last season. The Panthers finished the regular season 8-14 overall and 4-8 in the Cross County Conference. The Panthers closed out the season Thursday, Feb. 15, with a 63-23 win over Middletown Christian, claiming their third win in the last five games, which also included a 58-39 win over M-V.
Against MC, it took the Panthers a while to get warmed up. South was just 3-for-18 shooting in the first quarter and still held an 8-4 advantage. The Panther broke the game open in the second quarter. Leading 10-7 with just over five minute to play, South went on a 19-2 run to close out the half and take a 29-9 lead into halftime. The Panthers opened the third quarter with an 8-0 run for a 37-9 lead just two minutes into the second half. After MC cut the lead to 37-15, South closed the quarter with a 9-0 run to take a 46-15 lead. 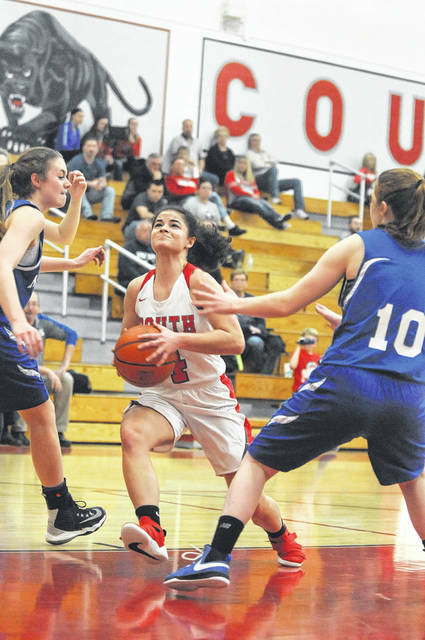 The Panthers were led by seniors Mylan Crews with 14 points and Kelsie Shafer with 13 points. McKenzie Neal tossed in nine and Madison Johnson chipped in with seven. ”Proud of the improvement that we were able to make this season and proud of the improvement and impact that all of our seniors Crews, Shafer and (Abby) Bingham were able to make this year. 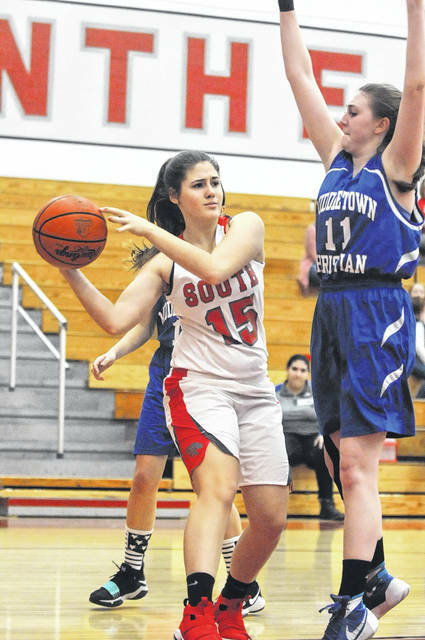 They will all be missed next season,” South coach Brody Rike said. 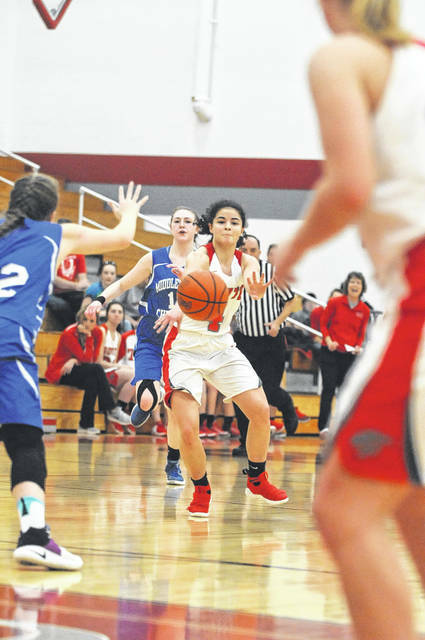 Against MV, on Monday, Feb. 12, the Panthers held a 13-9 lead after the first quarter and extended it to 32-21 at halftime. 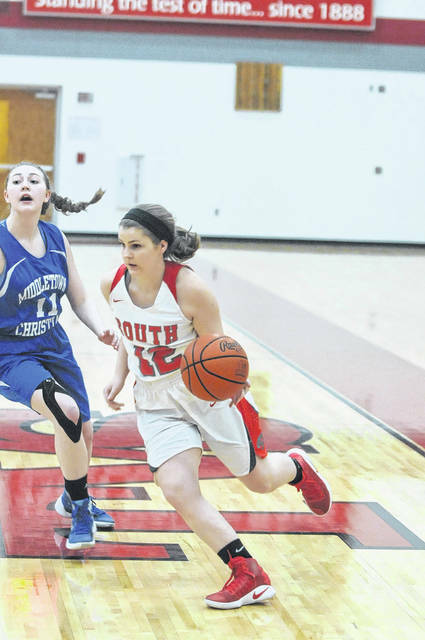 South held the Blackhawks to just two points in the third quarter as it extended the lead to 43-23. Shafer led the way with 19 points, while Crews had 17. Taylor Bowers added eight and Johnson contributed five. The Panthers were scheduled to open sectional tournament play on Tuesday, Feb. 20 at Brookville High School against No. 3 seed Covington. 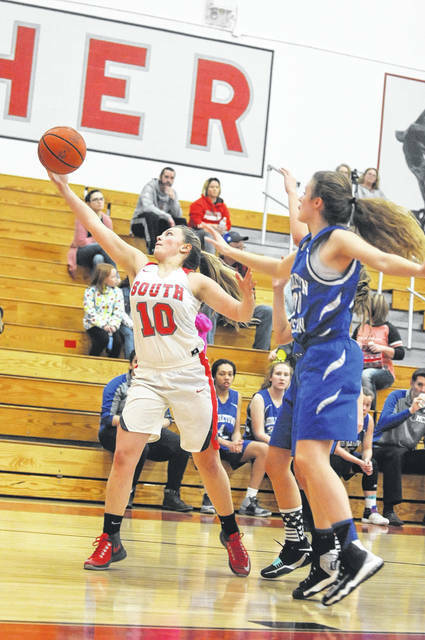 https://www.registerherald.com/wp-content/uploads/sites/41/2018/02/web1_tvsgbk3-1.jpgTwin Valley South’s Mylan Crews with led the way with 14 points in the Panthers 63-23 win over Middletown Christian on Thursday, Feb. 15. With the win, South doubled its win total from a year ago.